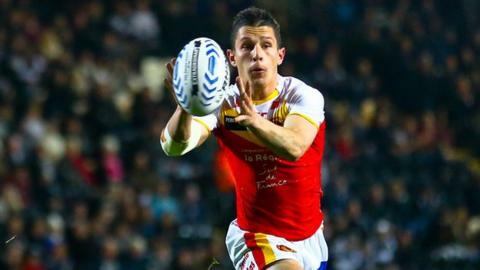 Morgan Escare ran in his first hat-trick as Catalan Dragons beat Salford Red Devils at the Stade Gilbert Brutus. The Dragons' fifth win of the season was enough to lift them to ninth in the table, as full-back Escare took his season's haul of tries to 10. Salford hit back from 16-0 down to lead at the break after tries from Francis Meli, Danny Williams and Greg Eden. But Zeb Taia and Leon Pryce added to Daryl Millard's first-half try, before Escare completed his treble. Gareth Hock added a second-half try before a William Barthau penalty, the fifth of his six successful kicks, Escare's 70th-minute try and a last-minute Eloi Pellsier drop goal closed the door on a late Salford comeback. The hosts, already missing several injured players, were further hampered when they lost Olivier Elima in the warm-up with a thigh problem. "I thought we defended our try line well, even if we conceded 24 points. We could have lost by fifty points if we had the same defence as we had at the start of the competition, but we have improved technically as well as mentally. "In the first half, they had 11 phases more than us on our try line. That takes a lot of energy and they didn't score until the end of the half because we were low on energy. "Leon Pryce had a great game for us out there again. He has been awesome. He was struggling with his knee last week. That is one of the reasons we didn't perform, but this week he lifted the team." "Catalan have always got a niggly type of game plan, They are a very niggly team. There are always frustrations from the other teams when they play Catalan. That is a regular occurrence. "For us it was individual errors that cost us the game, probably cost us 24 points, if I'm honest. "Our systems stood up pretty well. It was just individually, three or four people allowed some soft tries." Catalan Dragons: Escare; Oldfield, Pomeroy, Duport, Millard; Pryce, Barthau; Elima, Pelissier, Simon, Taia, Anderson, Baitieri. Replacements: Maria, Paea, Garcia, Pala. Salford: Eden; Williams, Gleeson, Sa'u, Meli; Chase, Smith; Morley, Lee, Tasi, Hock, Hansen, Rapira. Replacements: Puletua, Griffin, A Walne, Tomkins.